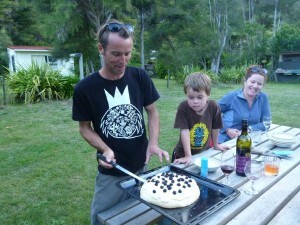 Awaroa – X marks our spot! We had stayed overnight at Rowan Cottage in Motueka just one of the great Womens Travel Accommodation network. 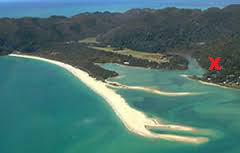 Today we are heading for Awaroa, a small settlement in the middle of the Abel Tasman National Park, where we have rented a bach (in NZ = cottage) for a few days. First stop the Aqua taxi – you can drive and then walk, but it is a LONG way, and most people move about the Park by Water Taxi – but if there are a few of you – better book in! 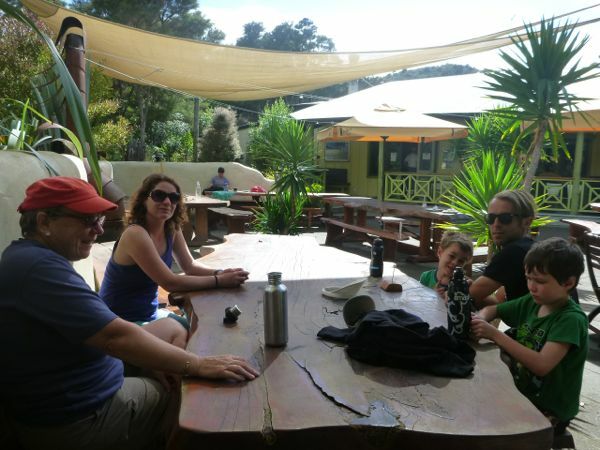 There are six of us in our party – four adults, and two children, four drove up from Christchurch, two down from Hamilton via Auckland and a direct flight to Nelson. We were early, but soon more packs and people are dropped off, I wonder how we are all going to fit on an 18 seater boat. I feel better when three of them line up behind their tractors, and the load up begins. It is soon clear that our luggage and our 6 passengers are not going to all fit on the same boat. Visions of airlines loosing baggage flash before us. The other boat captain assures us it will be OK and the luggage will be there when we arrive. We count of 13 pieces of luggage, which turns out to be a good thing – as one is identified as missing when we arrive. 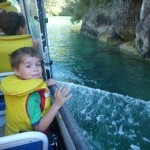 It is however on the boat, so all ends up well. The trip up to Awaroa inlet is not just A to B – we are taken south to split apple rock and a geology lesson, then out to an island to see the seals – a mother sunning herself on a rock as her youngsters frolic in the water. 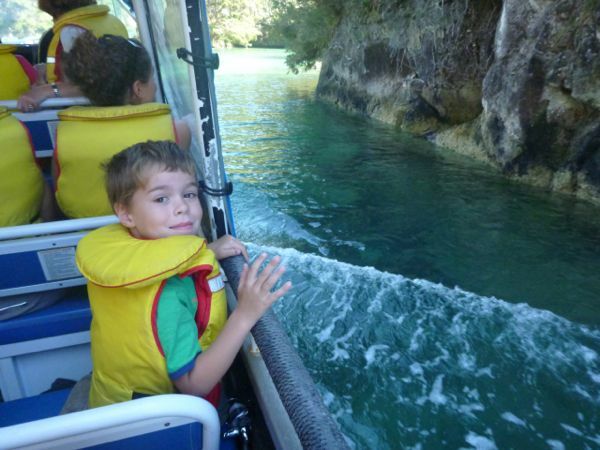 The tide is high enough for a cruise into the most beautiful tiny inlet, which is hidden from view except for those in the know! Next problem – will we get into the inlet which means a short walk, or will we be dropped at the main beach in which case it is a long walk. The tides is OK, we are dropped off in the inlet, which is great as 13 bags would have been quite a lot to transport for 6 of us in one go. How to identify our bach – The captain said – up the stairs, you can’t miss it. We wander past a few baches, one owner asks us where we are going – we say Judes Place – and he says next door. Sweet. We have booked this through Bookabach – more on Bookabach here. We find the key where we were told. Turn on the water, the gas, the solar system, start the gas fridge. It all takes a while, but before long we are sorted. This is our home for four nights. Our ‘Bach’ is Jude’s Place, one of just over 20 family bachs here built in 20-30 years ago. Solar light, gas stove, fridge, hot water and BBQ. There is a cupboard filled with games for the kids, and a cupboard of adult games and a huge range of books to read. In a shed outside there are some water toys, and ball games. We are set – we could happily stay for a week or two and not get bored. 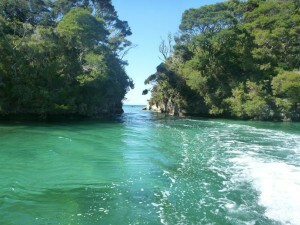 The only thing I would have liked is another kayak so a couple of us could have gone out for a paddle around the inlet. 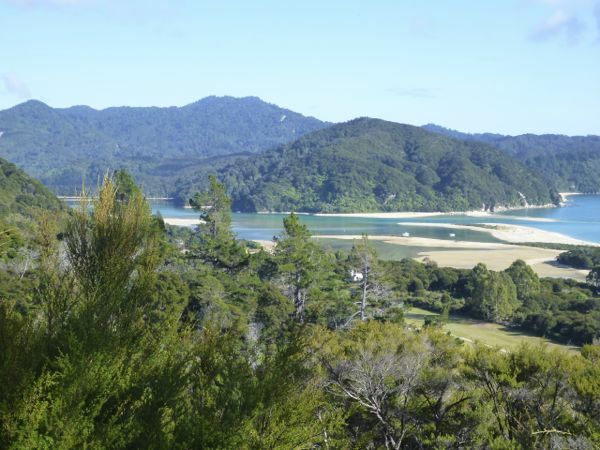 We are in the middle of one of NZ’s great national Parks, so some walking is on the cards. First day we plan a one hour walk to Onetahuti. We have two children with us, and that seems manageable. We pack some snacks, and water. The track is wide and well formed, easy walking. We hear and then see two bellbirds – just a metre away, so we can see their olive coloured feathers. They are larger than i thought, and seemingly abundant here. The cry of Tui and bellbird compete in the bush, and the fantails skip along beside us. We are enjoying it, though after an hour we seemed to be a long way from our destination, and the kids are suggesting it is time to go home. We pass two backpackers and ask them how long to the next beach. The bad news is it is still one and a half hours. The good news is the turn off to the Awaroa Lodge and cafe is only 10 mins away. We have also reached the highest point in the track where stunning views over the Awaroa Inlet are around every corner. Easy choice. Another 10 mins through a beautiful wetland, and the sound of a guitar playing and solar lights and we know we are in civilisation once again. A beautiful outside patio, packs and backpacker scattered around, and we order some flat whites, fluffies and a couple of slices. Very nice. not the best coffee I have ever had, but who cares, it was good enough, and we were all definately ready for it. We walk out to front beach where we find a spot to play – an inlet with rocks to jump from, leading out to the sea. The water is so clear, the sand so golden… this is paradise. It is now high tide and we are on the opposite side of the inlet to our bach. The only dry way home is the way we came, and no one can face that. So we walk along front beach until the end, then wade through to an island, and through again to another small island. From there we can see across the expanse of deep water to our place. Kamala swims across to get the kayak, followed by Giles who realises we probably need two kayaks. They return and get the bags, and the two children,and Cynthia and I swim across home. All safe and sound, another adventure to write home about. Next night there is the welcome sound of heavy rain – I won’t feel so guilty having a shower, but by 9am it is sunsghine again. 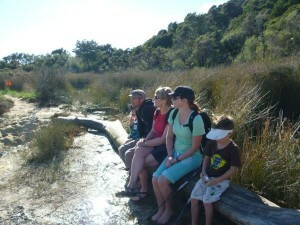 Tide is out, so we walk up the inlet to the Awaroa hut and DOC camping ground, and back again through a gorgeous salt marsh swamp. Coffee is brewed at home today, and tastes great. Day three we decide to head north across the inlet at low tide. 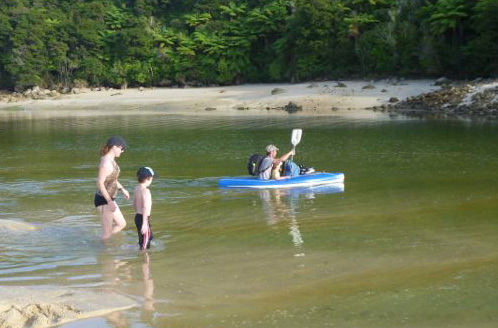 We take the one kayak because while it is low tide, we will be crossing the main channel. Kayak is for small children and packs, the rest of us swim over – brrrr it is cold – water off the mountains. We find some rocks and a small beach with mussels growing on the rocks. There is little wind, and it is glorious sitting in the warm autumn sunshine. Tonight we had our last swim, we sat looking over the inlet as the tide went out, watching the oyster catchers reclaiming sand islands. It has been a great holiday!